Find the area of the region bounded by the curve $y^2 = 4x$ and the line $x = 3$. If we are given two curves represented by y=f(x),y=g(x),where $f(x)\geq g(x)$ in [a,b],the point of intersection of two curves are given by x=a and x=b by taking common values of y from the equation of the two curves. Clearly the equation $y^2=4x$ represents parabola with vertex (0,0) at the origin and axis of symmetry along the positive direction of x-axis as shown in the fig. x= 3 is a line parallel to the y-axis.The region is the shaded portion as shown in the fig. 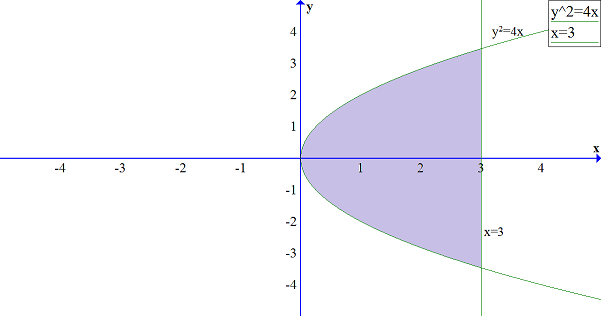 A=2(area bounded by the parabola and the line and the x-axis). Hence the required area is $8\sqrt 3$sq.units.